Eastbrook Plaza - W. T. Grant Co. 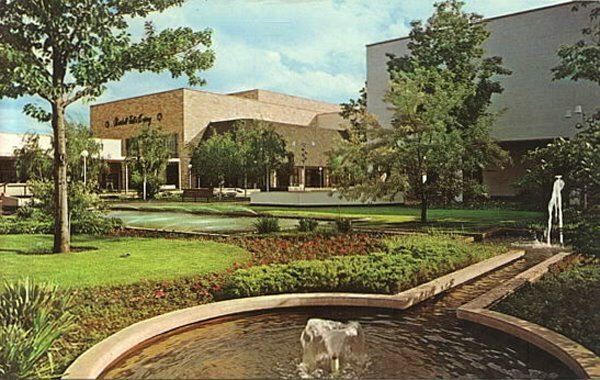 The peaceful, well-manicured landscape surrounding Oakbrook Center. This looks like a good spot to sit and contemplate the meaning of consumerism and our place in this great big shopping mall we call life. And our navels. I was going to comment on how much this mall always reminds me of Old Orchard, in Skokie, IL, when I discovered the reason; same architect (Richard Bennett)! I had never consciously connected the two places together before, but always thought the malls reminded me of one another. Now I know why. 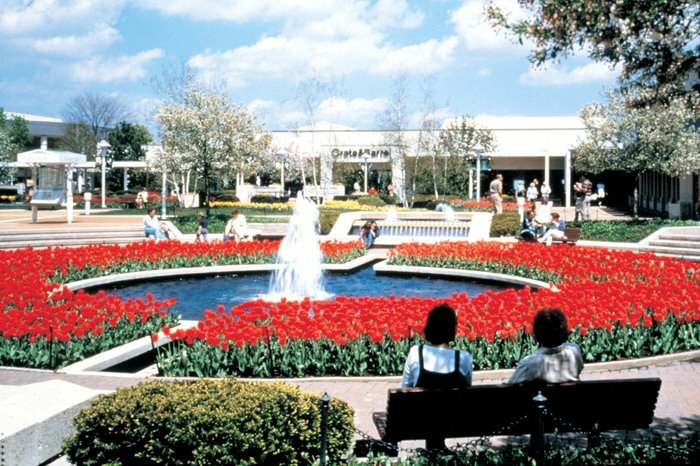 To the left you'll find of shot of this same fountain area as it looks today. Apparently, it's still very well taken care of, and still a sight to behold--especially in the Spring and Summer, when the flowers are all in bloom. They have yet to put a roof over this mall. Aside from some minor cosmetic changes and an addition of new mall shops and a Nordstrom in the past decade, the mall's remained mostly unchanged from what I can see in these shots, compared to what I saw in person. This was one of several I visited in a 2004 trip down to the Chicago region. Golf Mill (posted about previously in the blog somewhere) was another one I took in while down there that year. Took in other malls down there as well last year. One of them was Harlem-Irving Plaza, which started as a large strip mall type complex and was eventually enclosed over the years. All the fake stucco in the world couldn't give today's lifestyle centers charcater like that. And, Matt, thanks so much for the update notes! Appreciate it. ...maybe I have a "logo fetish" since I always mention it ...freeze that great Marshall Field and Company cursive in your mind as it will soon disappear into the graveyard. Replaced with the blandest of the bland macy*s signs. Don't think I've seen a shopping center/mall in my area with this sort of thing at all. Still not too bugged at the Marshall Field's name getting erased forever persoanlly (having had Macy's once in Toledo as a kid). Not sure if "Lifestyle Centers" count much as malls other than just another excuse for more outdoor development. Interestingly, the Saks Fifth Avenue at Old O closed last year. Should be interesting to see what they do with the space. I.Magnin had a store here in the 1980's.